Bharatiya Janata Party (BJP) leader Subramanian Swamy on 29 April,asserted that if India Anna Dravida Munnetra Kazhagam (AIADMK) leader TTV Dinakaran's is involved in the bribery then it must be investigated and the law must take its course. 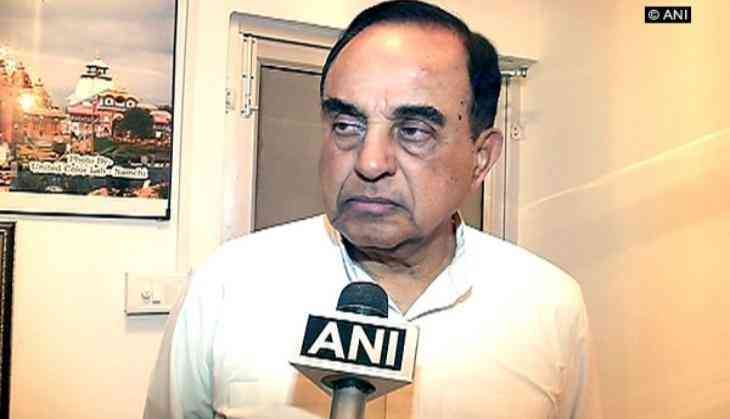 "The matter must be investigated and if Dinakaran is involved in hawala, then the law must take its course, but it shouldn't be linked with Election Commission, it has nothing to do with it," Swamy told ANI. Swamy added that it is a bit difficult to understand that how the bribery case has been linked with that of the Election Commission as these are two different cases. "I am still not able to understand this case. Was their bribery of the Election Commission? If so how did the Election Commission decide against Sasikala and Dinakaran's plea at the time she was the general secretary of the party and he was the Deputy General Secretary. I can understand if there would have been a case if the symbol would have been given," Swamy told ANI. He further asserted that the bribery and the hawala are two different cases and shouldn't be mixed together. "The election commission anyway gave a wrong decision in my opinion. When all the MLAs are with Sasikala how can they freeze the symbol just because Pannerselvam with one MLA claimed it," he said. Earlier on Friday, a Delhi Court sent alleged middleman Sukesh Chandrashekhar to judicial custody till May 12 and Hawala operator Naresh Jain in connection with a bribery case to police remand till April 30. The Delhi Police alleged that Jain helped Sukesh in money transfer. Ousted Dinakaran's house was searched on Thrusday and an informal interrogation was done with his wife, Joint Commissioner of Police, Delhi confirmed to ANI. Dinakaran was cross examined along with his 'friend' Mallikarjuna and P.A. Janardhanan, sources stated. During his third day of interrogation by the Crime Branch of the Delhi Police yesterday, Dinakaran finally accepted that he met Chandrashekhar, the man alleged to be the middleman in his bribery dealing with the Election Commission of India (ECI). Dinakaran, sources say, initially refused to have known Sukesh. He later accepted meeting him when Sukesh himself gave the details of his meeting with the former. However, Dinakaran maintained that he did not pay any money to Sukesh. Following this, the Delhi Police Crime Branch team visited Chennai, even as a Delhi Court granted five-day police custody to Dinakaran. Dinakaran had earlier moved a bail application in a Delhi Court. He was produced before the Tis Hazari Court.